Here is the list of the allergists who are planning to use Twitter to post updates from the #AAAAI17 meeting. The list is open for edit, please feel free to add your own info. It shows the availability of the allergists by date and if they are planning to attend the Tweetup (a meeting of people who use Twitter or are following the tweets). 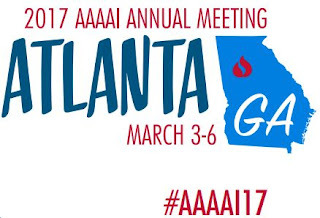 If interested in a real life meeting Tweetup during the #AAAAI17, sign up in the spreadsheet above. This will be the Sixth Annual Tweetup during AAAAI! We started in 2012.